Note: "Valkyrien" in Danish (Mlle. Valkyrien was a Dane) translates to "The Valkyrie," the stage name of Baroness DeWitz, who was so attractive that the King of Denmark gave her an award for her classic beauty. This film was made to feature her beauty. 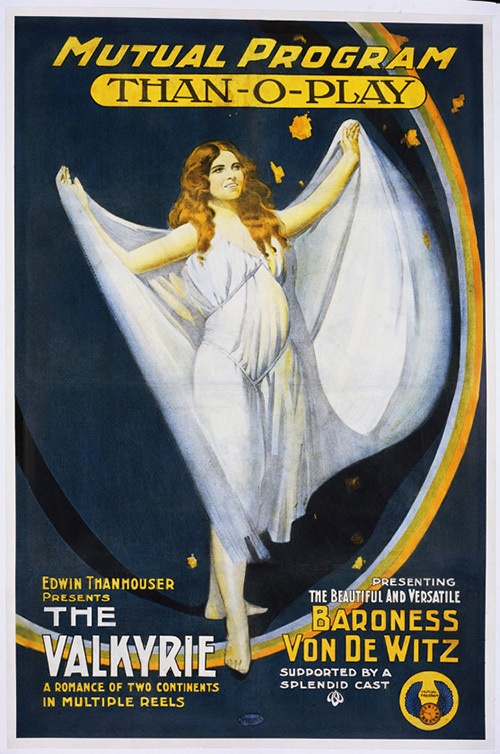 It was announced that Mademoiselle Valkyrien, known in private life as the Baroness DeWitz would soon be appearing in the three-reel Thanhouser film, The Valkyrie. "This is the third stellar lead in which Mademoiselle Valkyrien has created during the last three months. She starred in Youth, a Vitagraph Broadway Star Feature...followed by her portrayal of Diana in the mythological series of Diana at the Bath, which will soon be featured by the Pluragraph company...."
"'She is the most beautiful girl in my kingdom!' exclaimed King Christian X, of Denmark, when he saw the youthful Baroness von DeWitz make her debut in the Imperial Ballet at Copenhagen. On the strength of the royal approbation this fascinating young noblewoman has danced her way to fame, and into the mecca of all great artists of her profession - not excluding even Pavlowa - the motion picture stage. The Valkyrie, a three-act Than-O-Play, for release on the regular Mutual Program, November 27th, has been written about the romantic life-story of the Baroness herself, and the captivating Danish dancer, who recently created the spirit of 'Youth' on Broadway, stars in the title-role. In Denmark they still believe in Valkyries. While to us they are only mythical creatures of grand opera, neither to be loved nor feared, to the people of the wilder, more remote districts of Scandinavian Europe, the Valkyrien are evil visitors from another world, and always to be dreaded. Anybody's daughter may be possessed by the spirit of one of these earth-banished goddesses of war, branded with the anger of Thor, however innocent and attractive she may be of face and form. Indeed, a Valkyrie in human shape is particularly apt to be alluringly beautiful, since it is her work to entice the unsuspecting to their ruin. "Helga, a little Danish girl, descended from Norse kings, was believed by her superstitious neighbors, the mountain folk, to be a Valkyrie. She was a wild, joyous little thing, and all her playmates loved her. But one day a child of the mountaineers, in trying to imitate Helga's dancing, slipped and fell into a marsh and drowned. Her aunt schemed to marry her to a wealthy old nobleman to get her out of the way. The girl, however, repulsed his advances, and he uttered a tirade against Helga in the presence of a young American tourist. The American had met the beautiful Danish girl. He challenged her reviler to a duel. Believing that he had killed the old lord, he then fled the country. The nobleman recovered, nevertheless, and Helga, in desperation, escaped to the capital, where she won the 'Valkyrie Laurels,' a prize offered yearly by the king. After this came an offer to go to America. The old nobleman followed her. One day Helga overheard a plot of the nobleman's to ruin at the races the young American who had championed her. She hurried to the trainer, and insisted that she be allowed to ride his horse herself. She won the race. The nobleman, vanquished, left the country - and the young American joyfully surrendered to the spell of his Valkyrie." "This three-reel production has many charming points and is based on the belief of the peasantry of certain parts of Europe in the power of these fairy creatures. In the play a young woman who loves to desport on the green in the lightest of attire, becomes the terror of the peasants roundabout who believe her to be a valkyrie girl. A love story is brought in, and a duel is fought between two rivals for the hand of the girl. The production is of medium quality."